We have many inquiries about the size of our plants. There are many factors that determine the size of the rhizomes. Tall bearded: For the most part our rhizomes are very large and healthy. We have reduced the size of our digs to ensure that the Irises are shipped quickly which means that they will be fresh and viable when you receive them. Why is the size so important? The size not only determines the number of increases (new plants that will bloom in the spring), but also the opportunity for the plant to grow and flurish. We have had customers that forgot to plant the Irises when they received them and ended up planting in the spring. They bloomed that spring! We also have many reports of customers that had reblooming Iris bloom in the same year they were planted. They received the Iris in September and they rebloomed that fall/winter. But just like people, the genes of the Iris are different for each variety. Some of the Iris are very large, some medium and some small. For instance, Duke of Earl, Purple of Tyre, Ziggy, and Queen Dorothy produce small rhizomes. 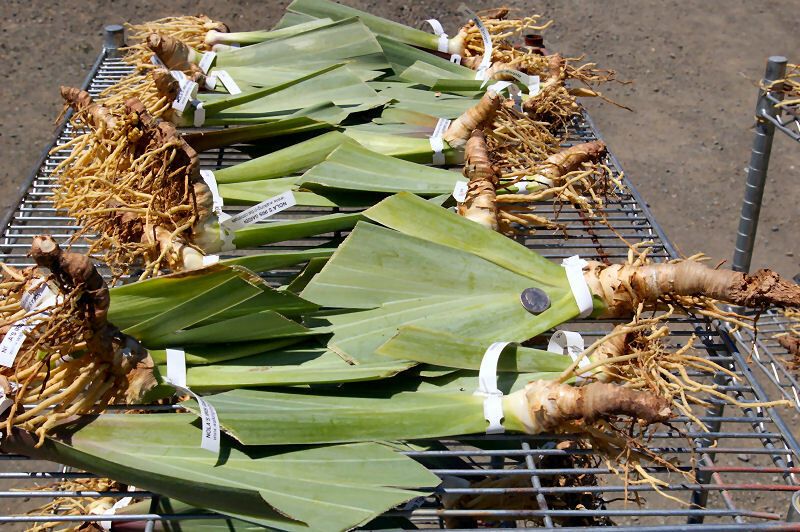 In many cases there is a correlation between the size of the bloom stalk and the size of the rhizomes. In all of the above Irises, the bloom stalk is 29 inches which is one of the smallest for tall bearded. By far the majority of the tall bearded Iris we dig have large rhizomes. 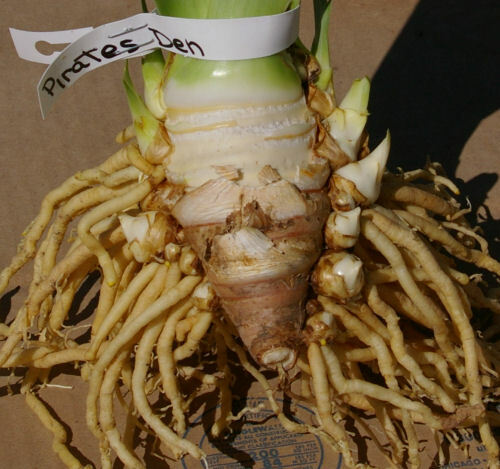 Intermediate Bearded - The IB's rhizomes will be smaller than the Tall Bearded Irises but many of ours will be larger than you will receive from other growers. Standard Dwarf Bearded - These are the smallest Iris we carry and as with the size of the bloom stalks (2-4 inches) the rhizomes are very small compared with the tall bearded Iris. When we dig the dwarf Iris we always try to supply more than one. The way we gauge the size and quality of our rhizomes is to look for the increases (new plants that should bloom for you in the spring). We attempt not to dig a rhizome without increases. The size and number of increases also depends on the time of our dig. The early (June and early July) digs will not have many increases and the rhizomes will be smaller than the ones we dig in August and September. Last year the size of our rhizomes was great. In our August and September digs most of the Tall Bearded Irises were Huge! You can see some of the customer reactions on our Facebook page or at Dave's Garden. Below is a photo of the Irises we were processing in July 2010. Although the rhizomes are large, there are not many increases. Once planted and growing the increases will come. See the photo below the July order and see the amount of increases in a September shipment. Photo taken late August 2010. This is one of our larger plants. I count at least 12 increases on this one. Many will be a blooming plant in the spring. It's like getting 12 Irises for the price of one. Of course not all of the plants have that many increases. The others will range from 2 to 14 with an average of about 6.